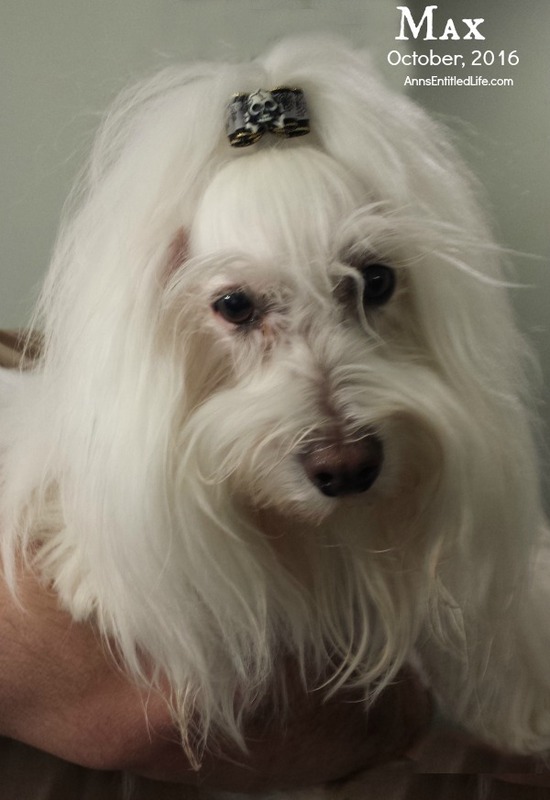 In July of 2014 Max, our (now) eight year old Coton de Tulear was diagnosed with GME. I’ve written about his progress extensively, here and here and here and here and here. This is the original post where I detailed the trail to diagnoses and recovery. If you subscribe to the Ann’s Entitled Life newsletter, you have read a few updates about little Max the last few weeks, and his ongoing battle with GME. This post is the full update. Max went back to Cornell for his Granulomatous meningoencephalomyelitis (GME) – a disease where the white blood cells attack the central nervous system – on October 7th. This was a six month scheduled check-up, and it came at an opportune time. For the two weeks prior to our return to Cornell for Max’s check-up, Max would occasionally cry out in pain when Hubby picked him up. I tend to pick him up length-wise under his body (like you’d hold a baby), so didn’t see any evidence of pain. I did, however, hear Max cry out those few times for Hubby. Since Max’s neurologist Dr. Slanina finished her full residency at Cornell and moved on to Cincinnati, Ohio, Max was assigned a new neurologist this time – Dr. Sarah Stephan. When Dr. Stephan took him back for his exam, she too noticed pain at Max’s lower neck, upper spine area. Her opinion was that it could be evidence of a slight GME relapse, or possibly a spinal disc issue. Little dogs with long bodies and short legs are definitely susceptible to disc issues. We went home on the 7th with a VERY upped dosage of Prednisone for Max – from 1.25 mg to 6.25 mg per day. And just like that, Max was on the Prednisone-diet again. It was decided that Max would take the upped Prednisone for 10 days, and see his vet. The thought was an MRI and possible disc surgery was in his future, either that or more GME protocols. Max was scheduled for his annual check-up with his vet here, and she did a full blood panel last week. His liver enzymes were elevated, but while she could find pain, she could not determine the cause. She agreed the MRI was probably for the best, so we contacted Dr. Stephan and scheduled Max’s MRI for this past Tuesday (the 25th). In the meantime, his Prednisone was lowered to 5 mg per day. Poor Mr. Max. He was admitted to Cornell Animal Hospital on Monday, they fed him, but Tuesday was no-food day due to possible surgery. I am sure he was ravenous! On Tuesday he was knocked out, and he had an MRI and they also did a spinal tap on him. When we returned later that day to discuss the results, we saw that Max’s spine was perfectly clear. No disc issues whatsoever. He didn’t show any “bright spots” on his MRI, which is good. The thought is he is having a mild GME relapse, and the Prednisone was already working to reduce the inflammation. Because the steroids can hurt his liver, and his liver numbers were already elevated, we came home with “the big blue pill”. Ugh. Denamarin. Max is a horrible pill taker and this pill is LARGE for a little dog. He’s supposed to take it without food, but there is absolutely no way. His old neurologist said it is better to get it in him any way we can than not get it in him, so into a piece of food it goes. He is also back on CycloSporine twice per day, the original 0.3 mls dose. This is the easiest drug we give him as I pick him up, place him on my lap, put the injector up to his mouth, and when he starts to yell at me (Max does not like anyone messing with his mouth), I shoot in the drug. Believe me, it is better than pilling him. We have some Pregabalin for his pain. He takes the lowest dose available 15mg once or twice per day. That won’t continue for long, however. We are hoping for two weeks tops. The Pregabalin makes him feel goooooooood. A little too good – if you know what I mean. Max is not back on chemo. Thank goodness! His oral meds may be close to what he had when the GME was first diagnosed, but without chemo, and Hubby and I are are hopeful he stabilizes soon. After all the good news of the past two years, Max has had a slight setback (at least we hope it is slight) this past month. We were told from the very beginning that the prognosis for Granulomatous meningoencephalitis (GME) is 33% of dogs go into full remission, 33% go into remission and relapse at some point, and 33% of dogs do not respond to the drugs. We were also told that the survival historicals are 15 days to 3 years. We are at the 27 month stage. The hope is that the CycloSporine will lengthen that time-frame for Max. • Max Exercises More Than I Do! • It’s A Mr. Max Post! Hello! My Chocolate Labrador was recently diagnosed with GME and I have read through your entries and just wondering how Max is doing? Harper is currently on Prednisone, Phenobarbital, and Leflunomide and monthly Cytostart injections. He had a seizure last week and the neurologist have added Denamarin and Keppra to his meds. Thank you for posting the details of Max’s Ordeal. Max is back for another chemo treatment. He’s at 3 years, 10 months after diagnosis which is fantastic. For more on what is going on with the little guy, I wrote this post last week. I hope your pooch responds well to the meds. It is a terrible disease but your dog can have a great quality of life under GME management. Unfortunately, they don’t have a cure (which really stinks), but the drugs can keep the worst of the GME symptoms at bay for a long time.